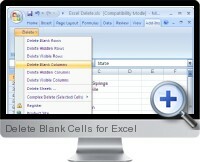 Delete Blank Cells for Excel can delete blank rows, hidden rows, visible rows, blank columns, hidden columns, blank sheets, hidden sheets, and delete data based on user defined criteria. Complex criteria for data deletion can be specific characters, numbers, spaces, values, etc. Delete blank rows within a worksheet. Delete hidden rows within a worksheet. Delete visible rows within a worksheet. Delete blank columns within a worksheet. Delete hidden columns within a worksheet. Delete visible columns within a worksheet. Delete blank worksheets within a workbook. Delete hidden sheets within a workbook. Delete all of the text before a specified character position. Delete all of the text after a specified character position. Delete all of the text before a user defined character. Delete all of the text after a user defined character. Delete cells containing a user defined character. Delete cells not containing a user defined character. Delete extra spaces before a specified string. Delete specified characters from a worksheet.